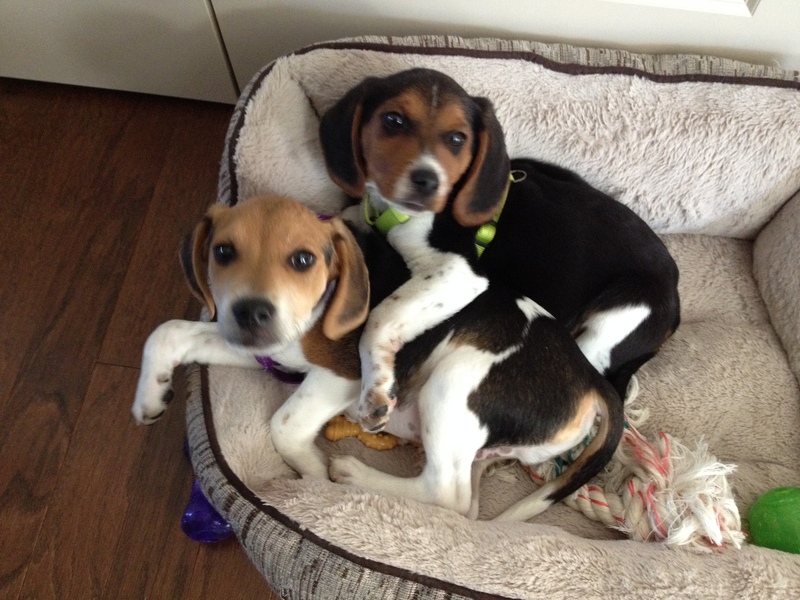 These 2 cuties are Casey and Finnegan my beagle/basset “bagels” that I rescued. I know you are thinking, “Awwwwwww.” Um, yeah. Keep thinking that. Now, I would like to point out something – this is when they were puppies, about 3 months old or so and started their reign of terror (they are a year now as I write my 1st post and still not entirely trust worthy. Just ask my carpet). They only LOOK sweet and innocent. They started by chewing innocent bones and toys and then all the sudden from the next room, I noticed something sounded…different. I looked over and one (or both) were gnawing on one of the legs of my furniture. My Just. Over. One. Year. Old. FURNITURE!!!! Blink of an eye – BAM.. gnawed. This happened SEVERAL times for a month or so in several tasty wooden locations until I discovered Grannick’s Bitter Apply Spray (thank you, thank you thank you! 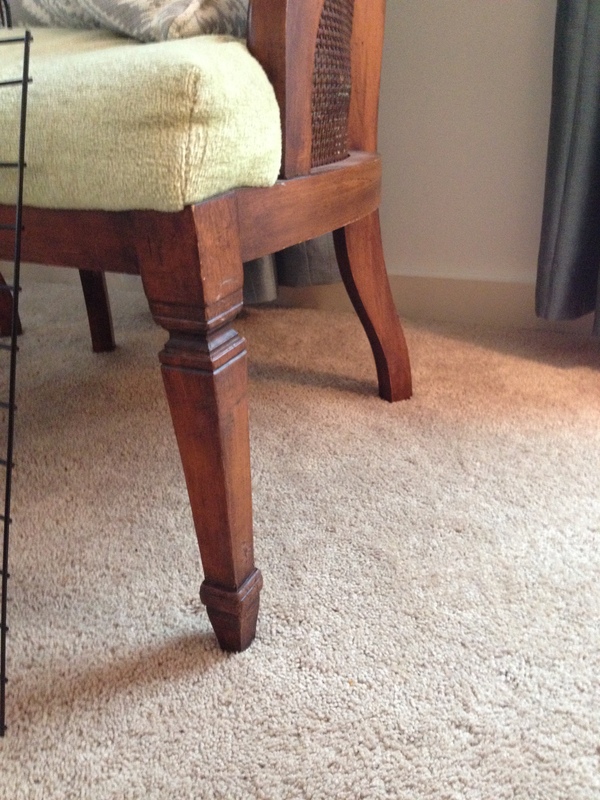 this product saved my life, or well, my dogs’ lives as well as my furniture). 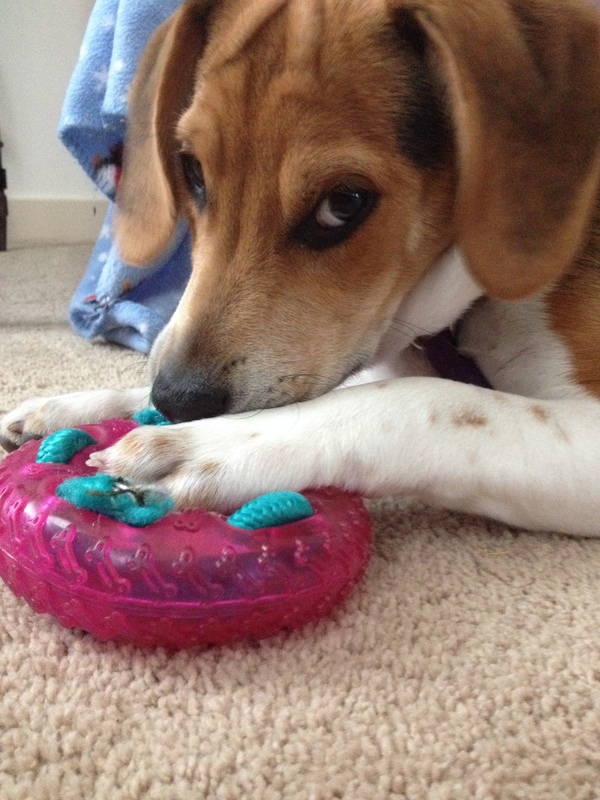 This is the look Finnegan gave me as I scolded him and gave him an appropriate chew toy. What an a$%hole. Now – let me tell you about me. I am single and self-supporting. I do NOT have money. I am a teacher, but right now am on hiatus. So you pretty much get the picture – there will be no hiring of hot fix-it dudes or taking my things to an amazing store for fixing by hot fix-it dudes (fantasy alert!). These repairs are up to me. I bought my townhouse in ’12, so basically everything is pretty new. 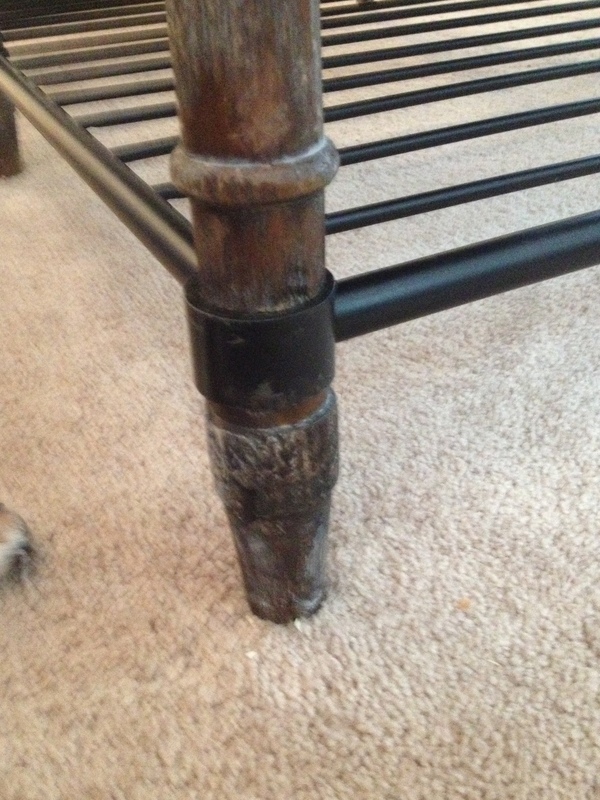 I could deal with repairing the new stuff, that comes with dog/puppy territory… but my dogs almost died when I discovered these “adorable” dogs chewed the legs of my antique 1940’s cane-back chairs. I adore these chairs. After putting my boys in their crates (for their own protection) and going upstairs to scream obscenities and cry for 1/2 hour, I calmed down and stopped picturing vivid ways to kill my dogs (ok, I wouldn’t really do that, but man.. they are lucky they are cute). Did a little research and then sort of “winged” my repairs. 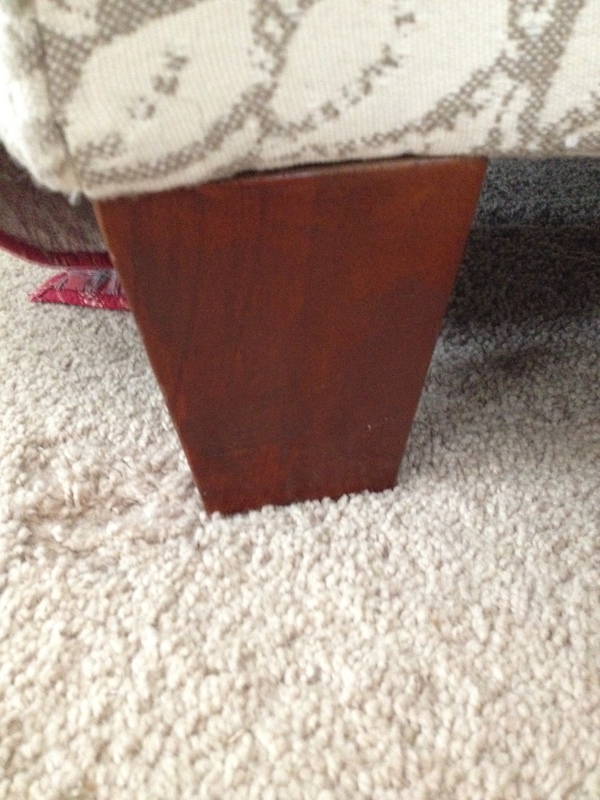 Here’s a pic of the damage as well as damage to my other furniture, after I did a wee bit of sanding. Not so cute now, huh? I bet that “Awwwww” of yours went to “Oh S&^%” in about 2 seconds, right? 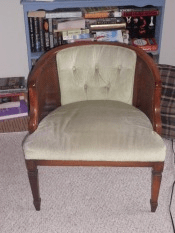 I was not looking to re-make or totally re-build the furniture. I’m no where NEAR that level of furniture savvy. Remember, I’m cash-poor at the moment so I wanted this covered up so it couldn’t be seen. That was my goal. #1 – I took some sandpaper and smoothed out as much of the teeth marks as I could. Now, there is wood filler – I bought Elmer’s stainable wood filler that can be used to fill in the deep teeth marks, but thankfully mine weren’t super deep and the sanding smoothed it pretty well. Oh, and yeah, they were on clearance for $.97. 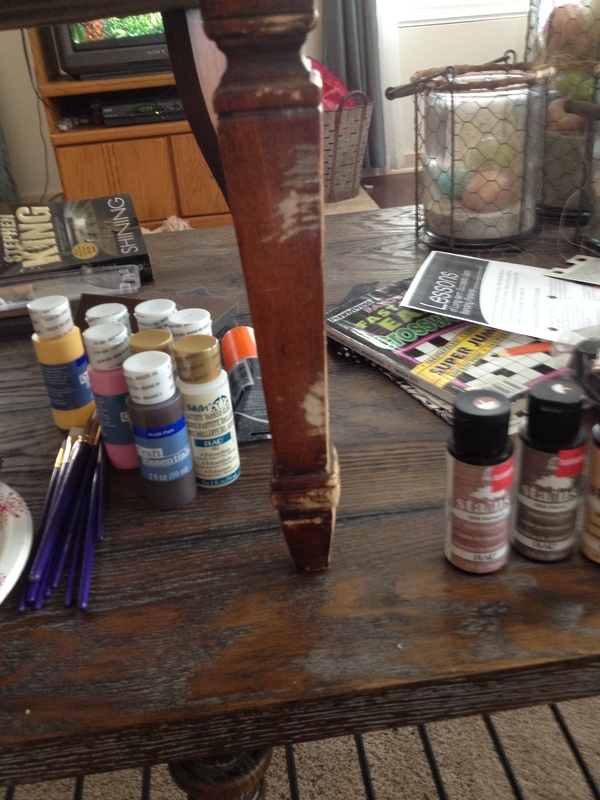 I got 3 colors – oak (medium), walnut (dark) and mahogany (darkish-red).These say to use on untreated wood. 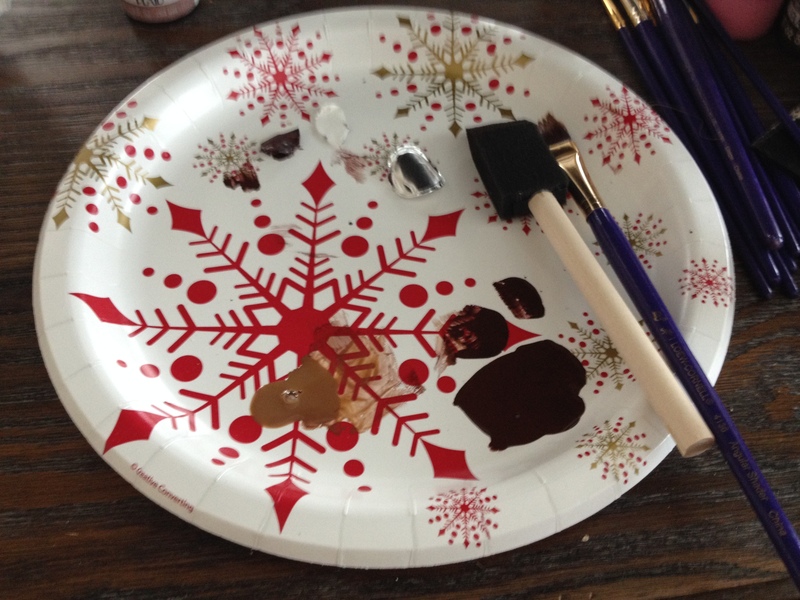 #3 I used the paper plates (duh, Christmas ones were on sale!) and blended the colors until I had the right shade for the chairs. I used the foam brush on larger spots and the paint brushes on the small, narrow ones and here’s how it looked after one coat. I also used paper towel to rub the stain in or to dab at parts or clean up if I applied too much. If the shade looks too dark, it’s easy to just wipe it up and re-mix and re-apply. Once you have it how you want it, wait for it to dry before another coat. I waited about 15 minutes. This table was my toughest one – this coffee table is drift-wood looking with distressing that’s sort of a bluish-white color. Used same supplies but added in some white acrylic paint mixed with a tiny bit of blue, just a tiny bit. I went back later and touched it up a tiny bit more. 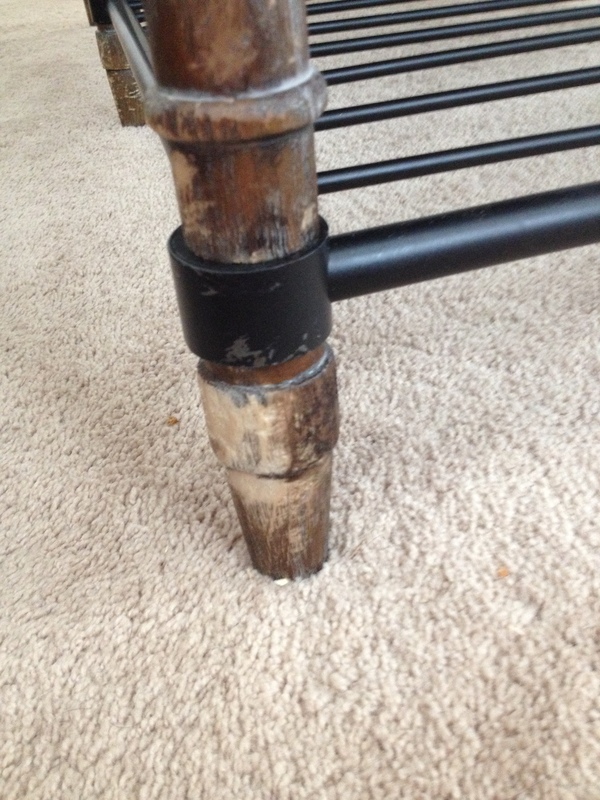 You can see the top of the table and how it looks above (it’s the table I set the chair on). And thus, the dogs are still alive…. for now. 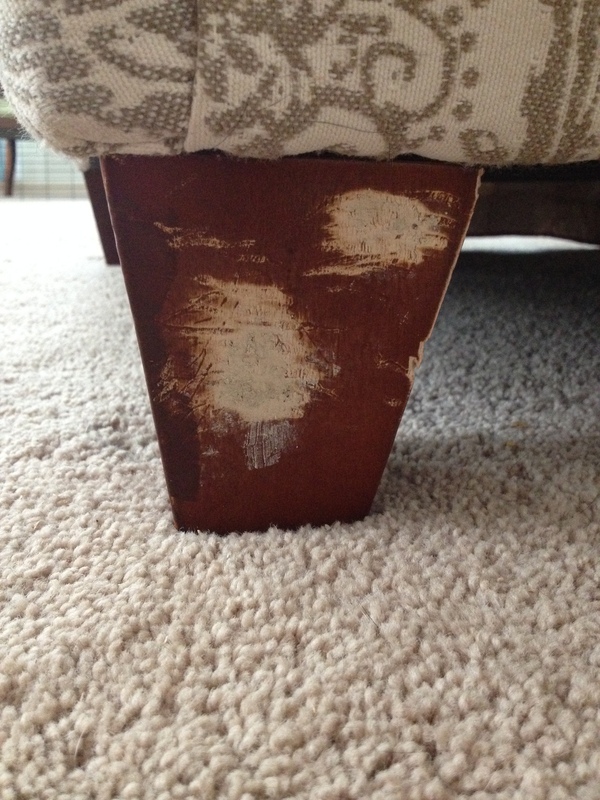 This entry was posted in Furniture Repair, Uncategorized and tagged chewed furniture, DIY, dog damage, furniture repair, puppy damage, water-based stain.